A cliché captured on camera. 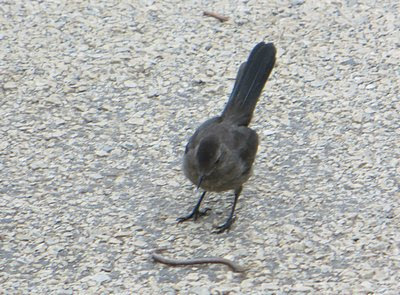 A gray catbird (Dumetella carolinensis) surveys an earthworm (probably Eisenoides sp.) early in the morning in Brooklyn Bridge Park. I've seen catbirds before on my walks through the Pier 1 section of the Park, where dense shrubbery and trees provide an ideal environment for them.